No blimps, and no alien rock formations, appear in the novel. I blame the cover artist who hadn’t even read the book. 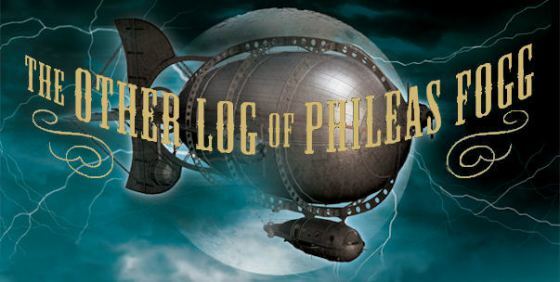 The title is the second-best thing about The Other Log of Phileas Fogg. 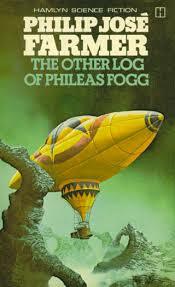 How can you resist the suggestion that Phileas Fogg kept an alternative log of his trip Around the World in Eighty Days? What else could have happened that the world didn’t know? 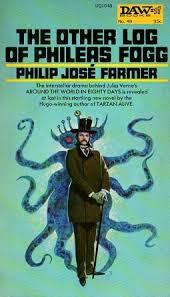 The first best thing about the novel is the answer: that Phileas Fogg and Captain Nemo (from Verne’s other cracking good read, Twenty Thousand Leagues Under the Sea) are murderously opposed aliens battling it out on Earth for the supremacy of their respective races. 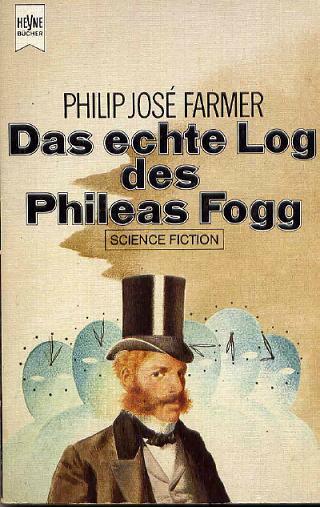 It’s not a very well-written novel, but having read no other Philip José Farmer than this, for all I know he’s not so much of a stylist, more an ideas and adventure merchant. The rather sloppy writing style doesn’t matter very much, because the exuberance of the concept will carry you through. Another blimp that didn’t exist. Honestly, what are they selling? I particularly like the way that gaps in Verne’s narrative are ingeniously backfilled with a mad story of Fogg’s early adoption by his step-father, his true origins as an Eridanean through blood transfusion and genes from Lord Greystoke and his tenth wife (what happened to Tarzan’s earlier wives?) and his commitment to the total destruction of the rival Capellean race. Around the World in Eighty Days is actually a search and destroy mission, Passepartout’s famous watch is a teleportation device, the rescued Aouda is also an Eridanean agent, and in the Pacific Fogg and Nemo have a titanic struggle aboard the Marie Celeste, abandoning it to be found abandoned, as they themselves had found it. Rather like a fantasy version of the Countryside Code, leaving nothing but footprints. Oooh, a hint of Cthulhu? Not really, but it’s better than the blimp covers. Farmer has probably weaved into his plot many more of the notables of late Victorian fiction than I have recognised. I spotted Moriarty, of course, but only dimly thought that the name Vandeleur sounded familiar, until I was told he was in R L Stevenson’s New Arabian Nights. The plot is strongest at its end, suggesting that Farmer was ingeniously working towards it all along, when the clocks of London all chime at ten minutes to nine in the evening. This event is probably the genesis of this enjoyable counterfictional narrative, because nobody, as Farmer notes, seems to have thought it weird that clocks would chime at such an odd hour, not on the quarter or the hour. There are no notes to this effect in the revised OUP edition of Around the World, so not even William Butcher, Verne’s most recent editor, seems to have wondered what Verne was on about. The German readers are far better served. Farmer produces a fine plausible reason for this bonkers public event, and caps the novel at its close by reprinting a 1959 essay from the depths of hard-core Sherlock Holmes investigations, positing that Captain Nemo and Moriarty were one and the same man. 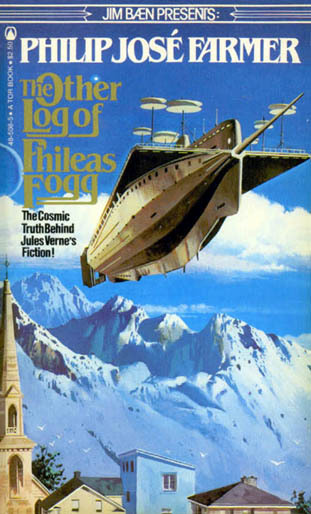 Given this supposition, the reader is thus encouraged to go back and read the whole of Conan Doyle and Jules Verne, and look again for Holmes in these newly revealed adventures of Phileas Fogg. I don’t think I’m going to do that because I do not have worlds enough and time to do the job thoroughly. I rather wish Farmer had done more thinking-through for the details of his Eridanean and Capellean struggles, but we can’t have everything. A little light internet research indicates that Farmer reused these alien races from appearances in some of his other novels. The existence of the Wold Newton chronicles online even manages (oh joy!) to bring in Dominic Medina from the Buchan universe. I am in fact dipping my toes in the waters of an ancient and highly popular resort of the imagination for readers of adventure and sf who like their preferred characters to hang out together in combat. It’s the first outing for the League of Extraordinary Gentlemen.